Cons: How good is he really? Dupre always played for a run-first offensive mind. Teams usually did not play a lot of press coverage against him, but when they did, the receiver struggled to get off the line (Alabama game especially). The former Tiger is a long strider, taking extra steps to get to full speed. The wide out fought the ball at times, either double catching it or trapping it to his body. This lack of strong hands is also evident as he doesn’t win many 50/50 balls as they get intercepted or simply knocked away. His route running is not crisp and will need to be less robotic tipping off those pass patterns. Pros: His high school experience in jumping allows him to sky above defenders while catching it at the highest point. He usually lined up on the outside, but would get sent in motion to create the best match up for him. Dupre tracks the pigskin well in the air, adjusts to poorly thrown passes, and seldom breaks stride getting under the ball, sometimes even behind the entire defense. The receiver can make a beautiful one-handed grab with a defender draped all over him on one play and drop an easy target the next. He is willing to snare the ball between two defenders and take a big shot using good concentration. Bucket catches are his staple near the end zone. Dupre shows burst in the open field, fighting for extra yards or spinning away from defenders. Because of him playing in a run-first offense, the wide out is an ok run blocker who should see the field from day one. 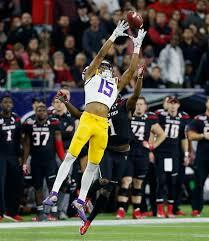 Overall impressions: In his limited targets, Dupre would either dominate as he did against bowl opponent Louisville (seven catches for 139 yards) or disappear against Alabama (three for seventeen yards). There is a lot of athletic talent to work with at the next level, but he will need some time to convert to the NFL game. Right now, I have him just outside my top ten rookie receivers. Thanks for reading. I will continue to discuss my scouting reports with you throughout the next few weeks, so keep checking the site for more content. Please check out my other content as well. You can also follow me on Twitter @AndrewMiley. « RB-Jeremy McNichols-Pass catcher extraordinaire and more?